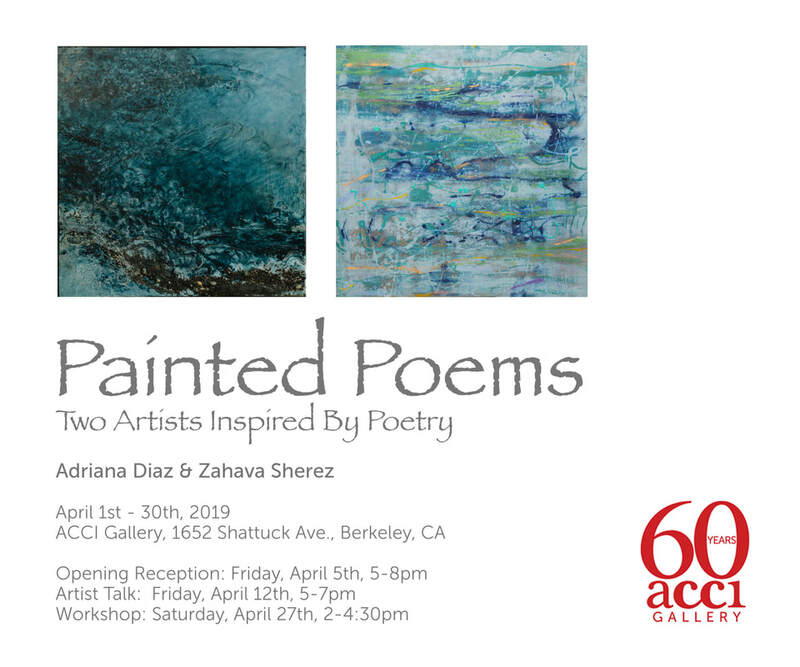 ACCI Gallery is pleased to present Painted Poems: Two Artists Inspired By Poetry, Adriana Diaz & Zahava Sherez. This two person painting exhibition will be a selection of works from both artists responding to the same poems. This pairing not only creates a dialogue between the visual and spoken arts, but also between the two artists and their own practices. We are two visual artists who have created paintings in response to poems by eight poets. Beginning in 2016 we decided on guidelines including not to use images appearing in the poems but rather use the emotions that the poem conjured in our souls to paint/translate/morphed it into the canvas. We chose our first poem and retreated to our individual studios. Every two months we got together to discuss and critique our last paintings and choose a new poem. Each of us brought “candidate poems” and we consciously selected a range of voices from different countries by both gender, agreeing on a poem that spoke to both of us in some special way. This creative process was challenging at times as it pushed us to deepen our understanding of each poem, of ourselves and of each other while it kept our creativity growing. Even though we worked from the same poem the painted results show how much we bring from our inner world. Join us Friday, April 5th from 5-8pm for the opening reception of Painted Poems. Additionally there will be an artist talk by both Adriana and Zahava on Friday, April 12th from 5-7pm at ACCI Gallery. Workshop information can be found on the ACCI Gallery 'Events & Workshops' Page.